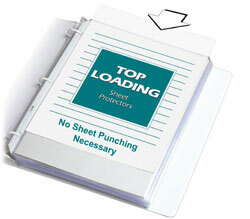 Unique side loading sheet protectors allow greater control while loading sensitive paper types. Unique side loading sheet protectors allow greater control while loading sensitive paper types. Sealed on three sides like top loaders, but papers are inserted from the ring binding edge. Keep high-use materials from falling out of binders. Heavyweight vinyl. 11 x 8 1/2. Clear finish. 50/BX. Sheet Protector Special Features: Clear vinyl, side loading sheet protectors are sealed on three sides and letter sized papers are inserted from the ring binding edge. Suggested Use: Papers are inserted from the ring binding edge, which prevents high-use material from falling out.